What we are doing to increase our population? What are we doing to decrease poverty? Since rural counties across the country have lost more population than gained, this quote and goal should be in every conversation of every rural board, organization, and business if there is to be growth in rural America. Gil Gillespie, retired professor of sociology at Cornell University in Ithaca, NY, points out, “population and poverty are complex issues with many causes. Population is important, but having a citizenry with a good balance of ages, a high rate of good livelihoods from their own businesses and employers, and interest in and commitment to the locality, are also needed." This pyramid shows where new jobs are created, but most economic development programs are geared to recruit “that” business to town so we can create “good” jobs. If we attract “that” business, it may be good for the community, but a loss for the community “that” business left. We’ve just shifted location, and perpetuated a win-lose game plan. Small business is the backbone of this country, creating 98 percent of all jobs on Main Street, in our neighborhoods, and countryside. Rural communities must undergo cultural transition in their economic development mentality that recruiting businesses will be our saving grace for jobs, because rural communities don’t have the workforce and can’t afford to give away the taxes required to compete to get corporations to locate in their town. Small communities must work differently – together – to grow, and may have to work around “good ol’ boys” clubs. Leaders may say, “We don’t have to do anything different, we're already doing this.” Recruitment approaches and decades-old methods of attraction worked then, but if still the primary form of economic development, communities lose population, schools, hospitals, and youth. Communities need a systemic, organized entrepreneurial process that allows people to explore business creation, ownership, and succession. There are resources to create pieces of the system such as business plans, financial statements, goal-setting, and pots of revolving loan funds. However, the best approach is a complete ecosystem that instructs, supports, and nourishes business owners AND a community who buys their goods and services. Processes that begin steady, consistent, long-term cultural transition to increase new leadership, address long-term, cultural issues and bring historically "warring" communities together see lasting success. Using bottoms-up, relationship-building, image-changing, sustainable approaches to grow rural areas, these Institutes build civility and have great growth benefits through building and strengthening relationships within and between communities. Think of your community. Are any of these issues being addressed at your city council/board of supervisors/economic development team/school board meeting or coffee shop? Do you have young people that are engaging in leadership positions and new ideas being promoted? How do does your community get along with neighboring towns? Collaborate or resent? Why? Is it beneficial to either of you? Are elected officials talking about population decline and increasing poverty? More importantly, what is being done about it? Is economic development being done the same way as it has for the last 100 years? What's happening? How are attitudes? What is said of each community and the county? What do you say about it? Your youth? If asked by a stranger, “What is great about living here?” and the answer is, “There’s nothing to do here, I can’t wait to get out,” is that the message to send guests who could be looking to bring a family and/or business? What about income opportunities? Not everyone is cut out to work for someone else. Do you encourage and support people starting or own businesses? Rural economic development must address people and poverty. Approaches must change if rural America is to grow. 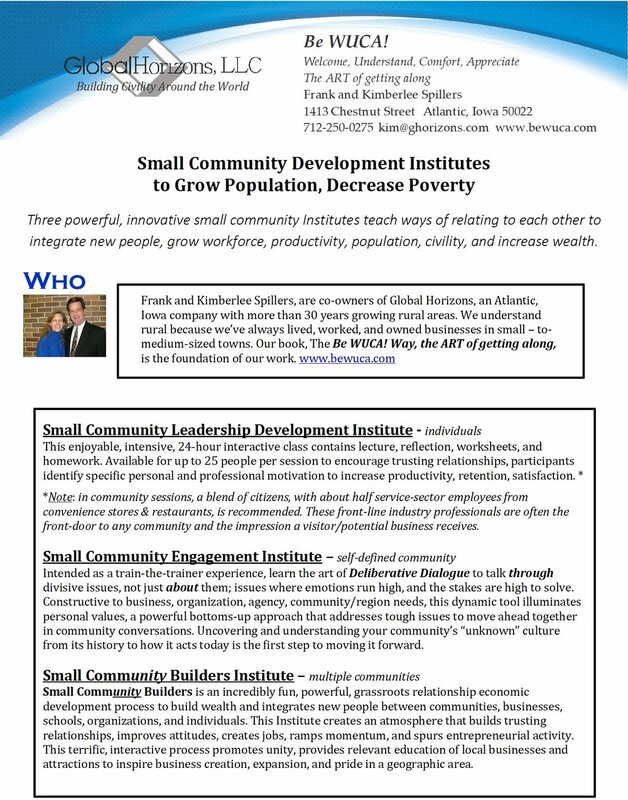 Learn how with Global Horizons' Small Community Development Institutes. We were told that WUCA! should stay out of politics. That we should focus on doing WUCA! and not get into the "mud" with the others. If new to WUCA!, the acronym is to Welcome, Understand, Comfort and Appreciate yourself and others for great relationships. bewuca.com. Actually, in part, WUCA! was created in response to politics. Politics where one side bullies the other and people don't get along in business, community, organizations, school, family, church - you name the entity. WUCA! asks how do you value other people? How do you value yourself? Do you look for ways to be offended and strike back or do you try to understand the "why" of the other person's thinking and build a relationship with them? WUCA! has the power to elevate and improve politics when you look inside yourself and take responsibility for the way you react to the outside environment. No one else can make you feel angry, sad, mad, glad, offended, or any feeling, only you can. You allow your feelings by the choice of the response you make. The Welcome in WUCA! is about self-responsibility and how you choose to feel. In each situation, determine the outcome you want and act to achieve it. Welcome frames your ability to respond in the way, with the words and actions, you choose, for the outcome you want. Understand is to listen. Do you really listen or just wait to talk? Listening involves all your senses because only seven percent of what is said is heard through the words spoken. Body language and tone make up the other 93 percent of what we say. Listening also involves the values and history of the receiver and speaker of the communication. How did they grow up? What were their parents like? What happened to them when their brain was developing during the first five years life, when the brain makes more than 80 percent of its neuron connections? Do you know the why behind the words? Comfort in WUCA! is to know your passion, have a purpose in life, with a clear vision of the future and goals to reach your vision. It is being comfortable in your own skin with who you are and where you are going. Appreciate yourself and others, as unexpressed gratitude is ingratitude. Appreciate people for who they are, while they are living. If you wait until their funeral to give their eulogy; it's too late for them to hear. From what we experience and observe, WUCA! belongs FIRMLY planted in politics and in life, for relationships - and politics - are all around us. How we behave and treat others is a constant and creates the world in which we live. When you Learn WUCA!, Act WUCA!, and Teach others to Be WUCA!, you will change the world. We know how to help people get along in all settings. If you'd like to know more, reach out to Kim, kim@ghorizons.com.